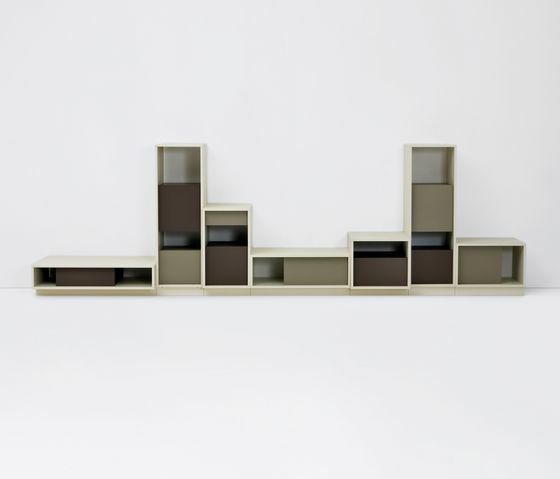 A storage system inspired by architecture. Like building units that add up, combined, they are reminiscent of housing blocks. The result is a small collection of six storage units. Each unit’s outer frame contains one or two closed volumes, or ‘parcels’. These parcels leave gaps within their frames and are opened via a door or drawer.Each storage unit has it’s own distinct character. They each work well as a solitaire and their different characters solve a variety of storage needs within interiors spaces. The base of each unit is a common element, allowing the different storage units to be combined together, creating unexpected and visually striking pieces of furniture. Additionally, Parcel has been designed to be positioned along a wall, or in the middle of a room or even as a wall-mounted version.